This beautiful home with burgundy red exterior exudes warmth and charm. It is balanced nicely with the gray shingles on second floor and the neutral gray-toned stone on at the entrance. The natural stained front door is welcoming and a nice value balance between the colors used on the siding. The gray trim around windows and doors is the perfect selection to highlight these elements without being to bright. The foliage is kept at a minimum with touches of red at the front walk and totally surrounded by greenery making for a dynamite home exterior. This pretty coppery exterior color is a sweet color choice for this home. Notice how the body and trim have a slight value difference. The trim is only a little bit darker than the body color which allows the eye to enjoy all the delicate details of the trim area without overwhelming. The light allows for lovely 'patterning' on the front facade. Notice that the ground cover has been considered in the overall color palette reflecting the warmth of the body color. Deep, soft violets have been used in hanging baskets which adds to the quiet color composition. Finally, the dark olive-green front door is a nice nod to nature and completes this pretty scheme. Charm is the perfect way to describe this exterior. The yellow is cheerful and the color scheme is in harmony with a lovely balance of a 'triadic' color scheme with the landscaping. Yellow, teal-blue and soft pink-magenta are so charming and add a happy note to this home. It is always about balance... soft vs. strong, light vs. dark... and this home does it perfectly! This is a most sensitive 'secret garden' sort of scheme. I love the green on the body of this home... the landscaping that surrounds it is made up of little patches of color and lots of greenery that play into the scheme. The red trim is a nice complementary choice. Care has been taken to have a nice play of color between neighboring homes. A perfect, colorful and charming community! This soft, sage green exterior body color is an excellent balance with the selection of red and magenta flowers that surround this home. White trim creates the perfect balance of tone and allows the body and foliage to live together in harmony. It is also important to acknowledge that the roofing color plays an important role in the overall color scheme. It is a beautiful neutral that blends perfectly... creating a visually stunning exterior. This dynamic blue exterior is set off with the painted white trim and the stunning foliage and flowers that strike the perfect note. Rather than compete with the striking blue... the flowers are soft and subtle. The deep rusty red and icy pink tulips are a delicate touch. 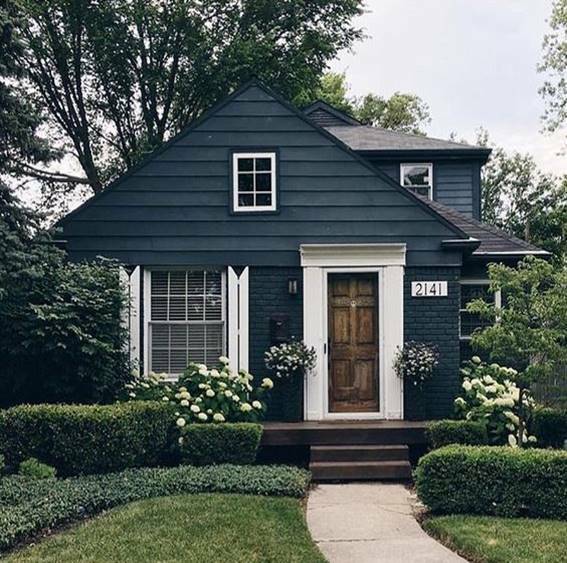 This deep blue exterior is extremely handsome. Restraint has been used in all decorative touches in the trim, flowers and foliage. All that is required is the white dynamic accents to tell the story of this elegant home. Soft blue gray plays an important role in this exterior. The shutters are critical to the success of this color scheme. Notice the beautiful balance between the cool blue of the shutters, the gold of the door and the deep purple-burgundy of the flowers. Exquisite harmony is the result. I love that the landscaping 'mirrors' the colors used on this home. It is almost as if it is 'reflecting' in a lake. The success of this color scheme is achieved through the balance of the dark warm reds and violets contrasted with the creamy neutrals of the trim and stone. It appears as a jewel in this setting. Exquisite is the perfect adjective for this home. The foggy warm gray and white of the exterior is contrasted with incredible beauty of the variety of greens and the white, soft pinks and lavenders of the flowers. This is a true story-book setting. No harsh colors... just softness and flowing color... sheer joy! The great aspect of having a neutral color on your home and trim is that you are able to treat the foliage with pure color abandon. This over-the-top execution of flowers is lush against this exterior. The variety of greens help to support an eye-catching portrait of this well designed color scheme. This is another great example of using color as you wish against a neutral exterior. In this scheme there are gentle warm wood details that accent windows and doors. Pinks, coppers, yellows and lavenders are all a great match for this quiet color-styled home... together they are perfect companions!